On 9 September, ITAR-TASS reported two Pacific Fleet Akula-class submarines had begun a three-week Northern Sea Route (NSR) transit to Severodvinsk for a “deep modernization” at Zvezdochka. They will reach the shipyard during the last ten days of the month, according to the Defense Ministry press-service. Pacific Fleet proyekt 971 / Shchuka-B SSNs Bratsk and Samara were loaded on Dockwise’s heavy transport Transshelf at Avachinskaya Bay on 23 August. This is the first time two submarines have been transported together. Nuclear-powered icebreakers will accompany Transshelf along the NSR. Until now, Pacific Fleet Akulas were repaired at Vilyuchinsk or Bolshoy Kamen in the Far East. Zvezdochka publicized the boats’ imminent departure back on 20 August. Buried in this item is a reported RF government decision on a shipyard division of labor, under which Zvezdochka will modernize Akulas and Zvezda (Bolshoy Kamen) will work on Oscar II-class SSGNs (proyekt 949A / Antey). But it looks like Zvezdochka already worked on the Northern Fleet’s Oscar IIs in previous years; Pacific Fleet units remain for Zvezda. Zvezdochka has a contract for four Akula modernizations. Two Northern Fleet units — Leopard and Volk — are already there. According to Flot.com, the 21-year-old Improved Akula Leopard arrived in 2013 and will return to the fleet in 2016. 22-year-old Volk got to Zvezdochka this year. Both were built by Sevmash in Severodvinsk. Akula II Bratsk and Samara — 24 and 19 years old respectively — were both built at Komsomolsk in the Far East. Zvezdochka’s “deep modernization” reportedly includes a recore and replacement of all electronic, control, and weapons systems. Let’s look a bit closer at what’s been said recently about future Russian submarine production. On February 2, at the Navy development session in Severodvinsk, Deputy Prime Minister Dmitriy Rogozin got the media worked up when he talked [or was, he claims, misquoted] about producing an aircraft carrier and six submarines every year. The Rogozin flap had scarcely settled when Kommersant wrote that its Defense Ministry source indicated the Navy now plans to procure ten Borey-class SSBNs, ten Yasen-class SSNs, and some non-nuclear submarines including six Proyekt 636 or Kilo-class diesel-electric boats. The paper referenced former First Deputy Defense Minister Vladimir Popovkin’s rather non-specific early 2011 comment about acquiring 20 submarines (apparently separate and apart from SSBNs) under GPV 2011-2020. Unfortunately, Kommersant’s failure to clarify this prompted others (e.g. Lenta) to conclude the Navy will get 10 SSBNs, 10 SSNs, and 20 other submarines. Nevertheless, most observers focused on a still robust number like 30 new submarines in the GPV (e.g. Novyye izvestiya). Eight or ten Borey units, and the rest Yasen or diesels. As long ago as late 2010, Trud’s Lukanin wrote about 8 Borey and 22 other subs (though he also mentioned a total of 36 new subs). Now we’re fortunate that Krasnaya zvezda provided a summary of Navy CINC, Admiral Vysotskiy’s remarks in Pushkin. He flatly said the Navy plans on obtaining ten new diesel-electric submarines by 2020. 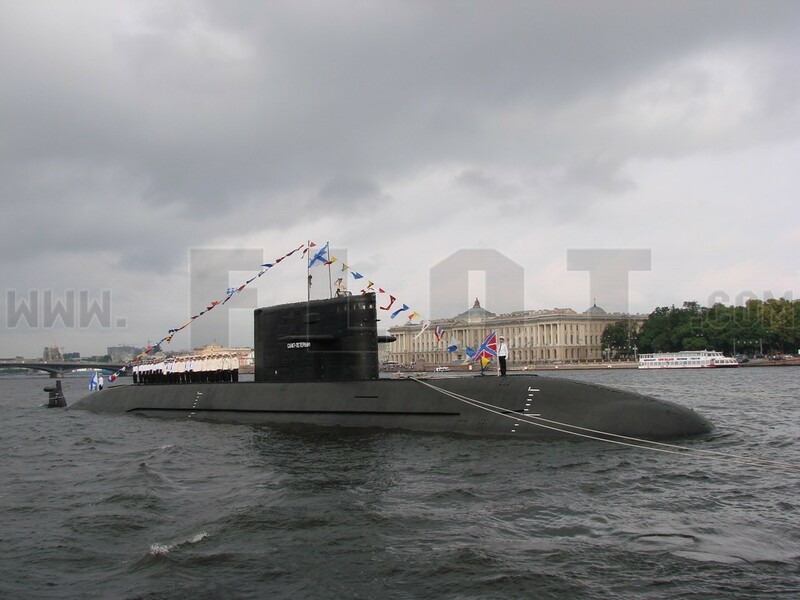 And, in early January, Mil.ru ran a press-release saying 8-10 diesel subs are coming. According to Vysotskiy and Rear-Admiral Aleksandr Fedotenkov, six will be Proyekt 636 boats for the BSF. But, interestingly enough, in his recent interview, Vysotskiy wasn’t asked and didn’t talk about sub numbers. It’s also interesting Yasen and SSNs aren’t the focus of more discussion and speculation given Rogozin’s announcement at Severodvinsk that Moscow would put resources into extra overhauls for third generation nuclear submarines (Akula-, Victor III-, and Oscar II-classes). This could ease the pressure for new SSNs. Still, the task set for the Russian Navy and submarine builders will be extremely daunting. They’re looking at reviving their force by launching between 20 and 30 new boats in much less than a decade. Your typical good news, bad news story . . . happily for the Russian Navy, the Severodvinsk is nearing its first at-sea testing, but the new submarine has also been held up as a prime example of outrageous price increases in this year’s state defense order. Final delivery of this SSN, as well as the first two Borey-class SSBNs, represents a big part of troubled GOZ-2011. RIA Novosti reports new fourth generation Yasen-class (proyekt 885) SSN Severodvinsk will soon head into the White Sea for two months of underway testing, according to Malakhit Design Bureau General Director Vladimir Pyalov. He added that, after this at-sea period, the final phase of state testing will take place. A very precise Mr. Pyalov says Severodvinsk is currently 98.9 percent complete. He thinks the Navy will accept the new boat before year’s end and, in all, six of these multipurpose submarines will be built. The second proyekt 885 Kazan is slated for delivery in 2015. RIA Novosti says proyekt 885 is a double-hulled, single-shaft boat with a reduced acoustic signature. The conning tower has a streamlined, oval shape. The boat is divided into ten compartments. For the first time, according to RIA Novosti, Russian designers put the submarine’s torpedo tubes amidships to allow for a new bow-mounted sonar system. Proyekt 885 has eight vertical launch tubes for supersonic cruise missiles. It has new communications and navigation systems as well as a fundamentally new nuclear power plant, according to the news agency’s report. 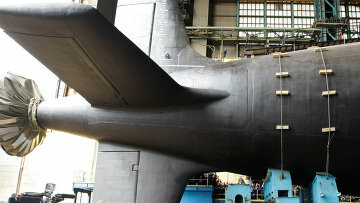 The new submarine is said to be first in noise reduction and stealth among attack submarines worldwide. 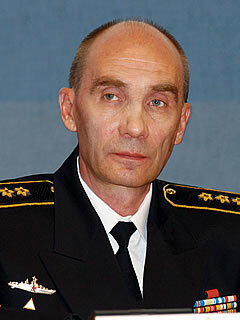 But the Severodvinsk couldn’t evade detection in the furor over breakdowns in the state defense order. 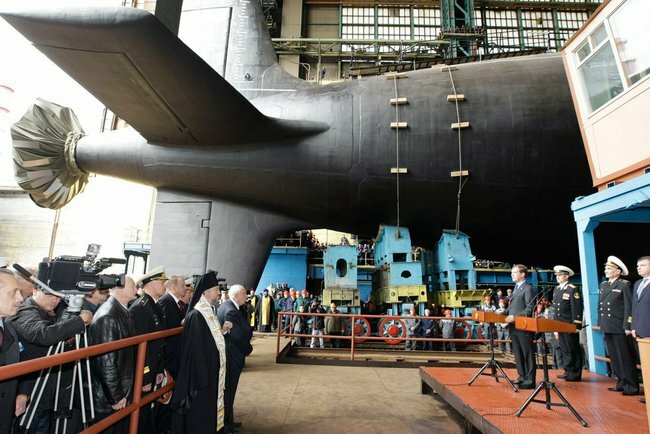 Earlier this month, RIA Novosti reported on disputes between the United Shipbuilding Corporation (OSK), submarine-builder Sevmash, and the Defense Ministry over naval construction in this year’s GOZ. In particular, the military accuses the builder of doubling its prices for proyekt 955 Yuriy Dolgorukiy and proyekt 885 Severodvinsk. An OSK spokesman defended Sevmash saying the cost of its work on Severodvinsk is only 30 percent of the total price, with the balance being the cost of armaments and components supplied by several dozen enterprises. He blamed inflation in the industrial sector and the economy more generally. But, he added he’s convinced the Defense Ministry will persuade the producer to lower its prices. 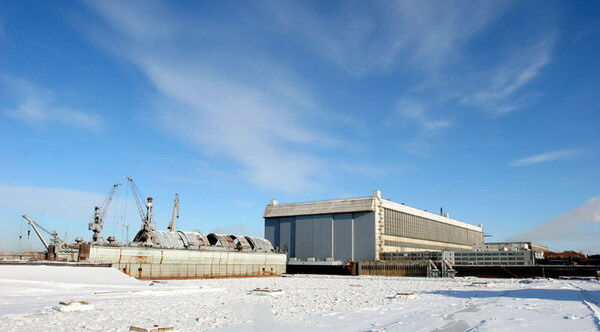 Izvestiya mentioned that Severodvinsk was originally intended for a production run of 30 submarines, now reduced to six more than 20 years later. As recently as March, the Navy still publicly hoped for ten. These must be bitter words for an enterprise that went many, many years without completing its trademark product — a nuclear-powered submarine.